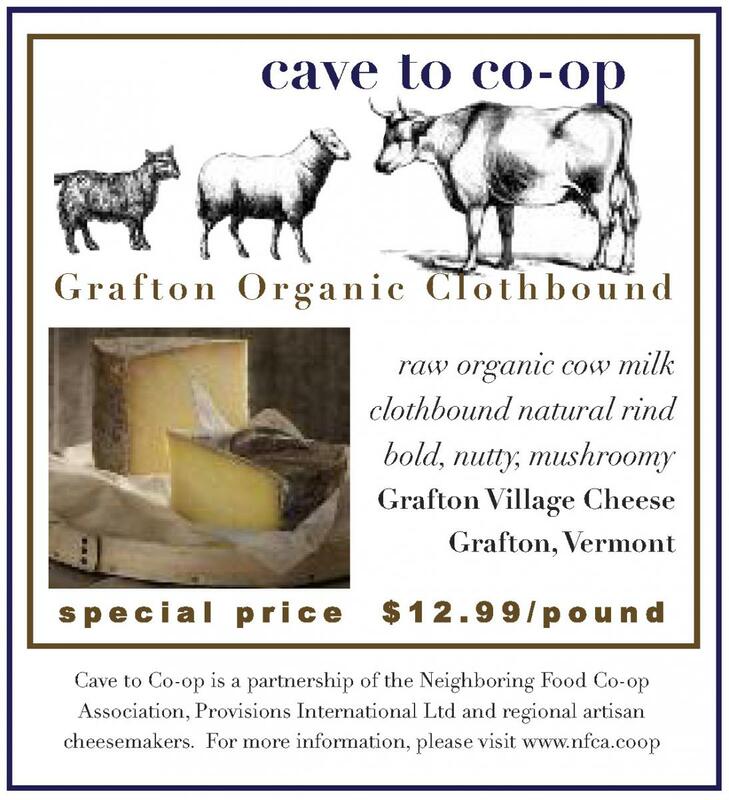 This month’s special cheese is GRAFTON ORGANIC CLOTHBOUND from Grafton Village Cheese, Grafton, VT. The Grafton Village Cheese Company was founded in 1892 as the Grafton Cooperative Cheese Company, to convert surplus milk from local dairy farmers into cheese. In 1912, the cheesemaking factory burned down and the community had no cheese facility until 1962, when the Windham Foundation restored the factory and brought cheesemaking back to the community. The Foundation is dedicated to promoting the rural communities of Vermont. The profits from Grafton Village Cheese go back into the Foundation to further its commitment to keep rural Vermont alive and thriving. Today, quality and taste are still the hallmarks of the company’s products. The Grafton Cave Aged line of fine cheeses takes Grafton beyond its roots in Vermont Cheddar cheese. The cheese is carefully matured in Grafton’s own cave aging facility using raw milk from small Vermont family farms that is thermalized and contains no artificial hormones. The rennet used is non GMO microbial rennet, suitable for vegetarians. Organic Clothbound Cheddar is classic milled curd cow milk cheddar wrapped in cheesecloth while it ages slowly in Grafton’s caves for a minimum of six months. Grafton Organic Clothbound delivers a very bold cheese with both nut and mushroom notes. Grafton Organic Clothbound is delicious any time of year on a cheese plate or in a sandwich or just eaten out of hand. Here are a few recipes as well. Melt the butter in a medium skilled over medium-high heat. Cook the pepper and onion until translucent and tender. Transfer mixture to a plate to cool. In a blender or food processor, combine corn and ¼ cup of the half and half and puree until thick. Add remaining half and half, eggs, flour, baking powder, salt and pepper. Process until well combined. Stir in the cheese and the reserved peppers and onion. Pour into the baking dish or ramekins. Bake until the pudding is set all the way by checking to see if a paring knife comes out clean when inserted in the center – 50 to 60 minutes. If pudding starts to get too brown, cover it loosely with a piece of foil. Serve immediately. Line two baking sheets with parchment paper or nonstick baking mats. In a medium-size heavy saucepan, combine 1 cup water, the butter and salt, and bring to a boil. Turn off heat and add flour. Mix with a wooden spoon until dough starts to pull away from sides of pan and form a lump. Set aside, without stirring, 5 minutes. Add eggs 1 at a time, mixing well after each addition. With each addition, dough will look glossy and slick at first; let it come together before adding next egg. Mix in mustard, cayenne and cheese. Dough will be quite loose and sticky. Scoop up a heaping teaspoon of dough and use another spoon to scrape it onto lined pan; it should form a mound about an inch in diameter. Alternatively, use a pastry bag or thick plastic bag with one corner cut off, to pipe small mounds onto pan. Repeat with remaining dough, leaving 1/2 inch between puffs. Bake until puffy and golden, about 25 minutes, rotating pans halfway through. Remove from oven and serve immediately, or turn oven off and open door slightly to keep puffs warm up to 1 hour. In a large saucepan, bring the water to boil, then whisk in the cornmeal in a slow stream to prevent any lumps. Add the salt, turn the heat to medium-low, and simmer, stirring occasionally, until the cornmeal is soft and the polenta is quite firm and pulling away from the sides of the pot (if the cornmeal is not yet soft, add water as necessary). Add the cheddar, scallions, and parsley, stir well to combine, then pour the polenta onto a baking sheet to cool and set up. Once the polenta is cooled and firm, cut it into 3-inch squares or circles (it should be about 1/2 inch thick). Whisk the eggs and milk together in a small bowl and spread the breadcrumbs on a plate. Dip each polenta croquette in the egg mixture, then the breadcrumbs. Heat the olive oil over high heat until almost smoking. Carefully add the croquettes, cooking in batches to avoid crowding the pan. Cook until golden and crisp, about 3 minutes, then flip carefully to cook the other side. Drain on paper towels and keep warm in a low oven while cooking the remaining croquettes. Serve with sprinkled parsley. Core and cube the apples – peel if you wish – and place in a medium bowl. Add the raisins, nuts and cheddar. Gently fold in the vinaigrette. Refrigerate for at least an hour and toss in the arugula just before serving.